The Conagra earnings report for its fiscal second quarter of 2019 includes some disappointing guidance. Conagra (NYSE:CAG) notes that it is expecting earnings per share for its fiscal full year of 2019 to range from $2.03 to $2.08. This is bad news for CAG stock as Wall Street is looking for the company to report earnings per share of $2.11 for the period. The poor outlook for fiscal 2019 comes in what is already a mixed Conagra earnings report for its fiscal second quarter of the year. This includes earnings per share of 67 cents, which is up from 55 cents during the same time last year. It also beat out analysts’ earnings per share estimate of 55 cents for the quarter. Unfortunately for CAG stock, the Conagra earnings report for its fiscal second quarter of 2019 also includes revenue of $2.38 billion. This is up from the company’s revenue of $2.17 billion reported in its fiscal second quarter of 2018. However, it wasn’t good for CAG stock by missing Wall Street’s revenue estimate of $2.41 billion for the period. It’s also worth noting that this is the first Conagra earnings report to come out since the company completed its acquisition of Pinnacle Foods on Oct. 26, 2018. The company says that Pinnacle was the primary reason behind its 9.7% net sales increase during the quarter. Despite this, organic net sales were down 1.6% due to the impact from hurricanes during the quarter. CAG stock was down 15% as of Thursday afternoon. 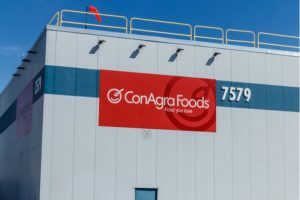 Article printed from InvestorPlace Media, https://investorplace.com/2018/12/conagra-earnings-guidance-hits-cag-stock/.